I propped my camera up against a nest of beach towels I crafted on the picnic table. It was a silver point-and-shoot, a present he gave me for Christmas. I framed the photograph with him standing on the beach, blocking the sun that was about to set behind the peaks, casting a long shadow on the golden, rippled sand. I clicked the button and the seconds started to tick off. I hurriedly planted myself next to him. I told him to look forward, to look at the setting sun. He laid his arm around my waist and I locked mine over his. South Lake Tahoe. August 2008. It was the weekend after Dennis and I registered as domestic partners in San Francisco, a little over a year after we started living together. It was a honeymoon to a wedding of some sort, the closest thing to a wedding we could have. If you knew me when I was a young man and told me that someday I would find love I would have laughed at the idea. I would have told you finding love isn’t written in my stars. I wasn’t just being pessimistic. I had every reason to believe so. Those were difficult times, I tell you. There was a lot of holding back, a lot of pretending. There was a lot of trying to fit in. I grew up saddled with expectations, believing who I am is a mistake that needs covering up, a mistake that needs correcting. But through some remarkable twist of fate I found love. Dennis found me. Call it chance. Or a stroke of luck. Call it a reward for doing something good. Or a prize for being patient, for persevering. I call it the best thing that ever has happened to me. Forgive me for being sentimental. I had originally planned to write about my American and his favorite sarciado [sahr-sha-doh], fried whole fish in tomato sauce, about how he loves fish and rice and how he eats with a spoon and a fork like a true Filipino but I ended up writing about love and about twists of fate. Truth is I really wanted to tell you this piece of good news — Dennis and I are getting married. It’ll be a small, simple wedding with family and friends in our home, in September this year. After all the ups and downs, after all the good and bad, we’re finally going to have the wedding we couldn’t have years ago. Season the whole fish by rubbing it generously with salt. Set aside. Fill a wok or a deep pan with an inch deep of oil. Heat the oil over medium to high heat. Place whole fish carefully in the wok and fry until it is cooked and its skin browned and blistered, about 6 to 8 minutes each side. Transfer whole fish carefully to a plate lined with paper towels and set aside. Transfer oil to a container for future use but leave a tablespoon in the wok for stir frying. Add garlic and stir fry over medium to high heat until lightly browned. Add onions and stir fry until fragrant and soft. Add tomatoes and stir fry for a few minutes. Add water and fish sauce. Bring to a boil and let it simmer for twenty minutes. 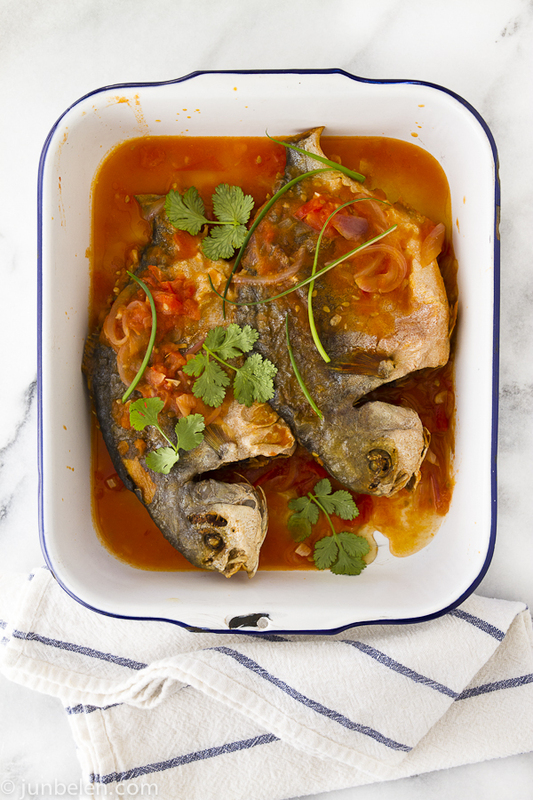 Add whole fish back to tomato sauce, add salt to taste, and let it simmer for another five minutes. Garnish with green onions and wansoy. Awesome news about your wedding! I wish you both many, many years of happiness together! I’m glad that you two found each other. Love knows no boundaries, the heart wants what the heart wants! Beautiful post, beautiful photo, and especially beautiful news. Congratulations! Beautiful story, I wish you both a lifetime of happiness! I can’t wait to try this simple recipe. My sincerest congratulations, Jun! Wishing you every happiness! Now, about the fish, can I substitute tomato sauce (or paste?) instead of using whole tomatoes? It’s a thing of mine, I’m ashamed to say; I have this weird thing about the seeds. Thank you very much! Congrats on the wedding! I had a small wedding too and having just your family and a few special friends makes it all the more intimate and special. And I have been waiting for this recipe! Will a tilapia fillet be good enough? I live in the midwest and fresh fish isn’t really that much common. I do want a a fish with slightly crispy outside, but without the fish scales/skin, I’m not sure how to go about it. Congratulations to you, too, Rio! Tilapia fillets would do just fine. Pan-fry it until there’s a good sear then add the fillets to the tomato sauce. Thank you! Yes, you can use tomato sauce instead of fresh tomatoes. Stir fry garlic and onions then add the tomato sauce. I know it’s tedious but you can also blanche the tomatoes, skin them, quarter them, then you can remove the seeds. CONGRATULATIONS!! This is wonderful news!! Congratulations Jun, I always follow your stories with pleasure. Waiting for your September big event is really happy moment of your life. Enjoy every bits of everyday… as you already do. Lovely news, congratulations to you both! (and the recipe sounds delish). Congratulations Jun and Dennis! I am very happy and excited for both of you! This post is just wonderful and I’m impressed that Dennis loves this very traditional dish and that he eats it the way we Pinoys do too! Cheers to you both! Aww, I love this post! I cannot not comment. Congratulations on the upcoming wedding! Sachiko, thank you so much! Tiffany, thank you for writing! And thank you for following the blog! Oh Jun, this is such fabulous news. You’ve shared with us the twists and turns of early life, your finding a path forward, settling and then the creativity born from reflection, introspection and love of family/friends/food/storytelling/visuals. Now we’re seeing your destiny unfold. I love it!! I love LOVE and so glad you found it. You’re a good man – I sense no judgement, no smugness – nothing but wanting a balanced and full life, and sharing it with others. Just one question though: How on Earth will you be able to hand over the CATERING and PHOTOGRAPHY to someone else? Ha! I can’t help but giggle at that thought. What a beautiful story. Congratulations!!! WOW! Thank you, Ian, for writing, And yes — I don’t think I could trust someone to do the catering and photography in my own wedding! Congratulations!! I wish you and Dennis a lifetime of happiness. I’ve been following your blog for about a year and wanted to let you know how much I enjoy it. Thank you for sharing not just your recipes but also beautiful snippets of your blessed life. Best wishes to you and Dennis! Good things come to those who wait. I’ve been waiting myself… for a fish sarciado recipe like yours! You’ve been an inspiration. I have bookmarked a lot of your recipes for guidance when I’m cooking Filipino dishes.